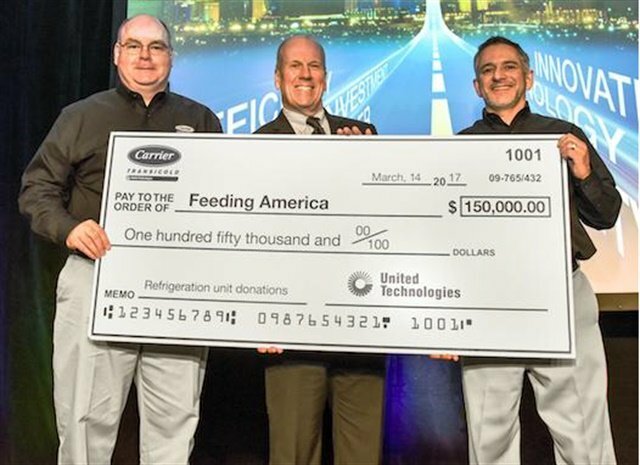 Carrier Transicold haa announced a program to donate truck and trailer refrigeration units to individual food banks in the Feeding America network. The program is funded by a $150,000 grant from Carrier Transicold's parent company, United Technologies, which will cover the donation and installation of refrigeration units for seven food banks. Funds will be disbursed to Feeding America member food banks in need of a Carrier truck or trailer refrigeration unit. The food banks are located in Louisiana, South Dakota, Michigan, California, Georgia, and Nevada. They will use the funds to purchase equipment and installation from an authorized Carrier Transicold dealer. Carrier Transicold South in St. Rose, La. Transport Refrigeration of South Dakota in Sioux Falls, S.D. Carrier Transicold of Detroit in Detroit, Mich.
Bay Area Transport Refrigeration in Hayward, Calif.
Carrier Transicold South in Lake City, Ga.
CT Power in North Las Vegas, Nev. Feeding America has a combined 1,850 refrigerated trucks in its fleet, which serve 200 food banks and 60,000 agencies nationwide. Part of the funding for the $150,000 grant came from proceeds from the book Food Foolish: The Hidden Connection Between Food Waste, Hunger and Climate Change, which was co-authored by John Mandyck, chief sustainability officer at United Technologies.